E-commerce is big. Really big. Over the past two years, it's grown from being an early 90's fascination into giving brick and mortar retailers a real run for their money. A recent Forbes report predicts that the e-commerce industry will surpass a $2 trillion annual haul in 2017. A related eMarketer report makes a bolder forecast of $4 trillion in retail e-commerce sales by 2020, accounting for 14.6% of all consumer retail spending. A measured 50% five-year growth, when comparing both of these forecasts, gives us a real idea of the juggernaut that this industry – one being fed by emerging technology – has become. It's e-commerce statistics such as these that really should open our eyes. About 71% of consumers are shopping online to find the best price, a process that is commonly now referred to as "showrooming" (checking your smartphone for the best price when in a brick and mortar store), and "webrooming" (comparing multiple e-commerce stores to find the lowest price). According to Business Insider, 50% of shoppers have made more than one purchase in the past year. Tally these numbers up, and technology has helped 198 million shoppers in the U.S. buy something online over the past 12 months. That's more than 200 million people shopping online, or about two-thirds of the entire U.S. population. 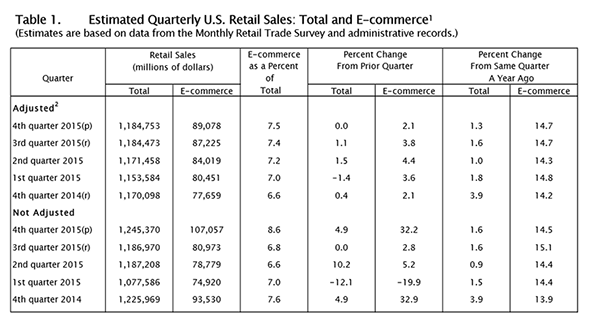 A report by the US Census Bureau (below) concurs, finding that 7.5% of Q4 2015 retail sales were derived from e-commerce. For that fiscal year, this growth measured in at just 0.5% annually. But between 2015 and the present, growth has increased ten-fold. And it's set to do it all over again between now and 2020. 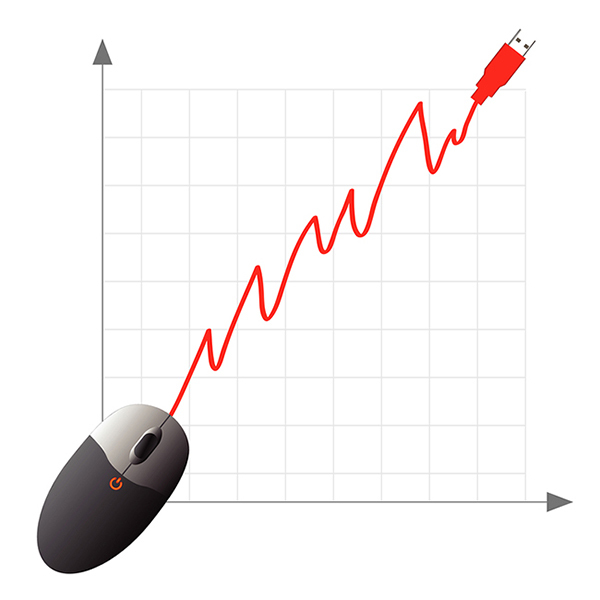 Pertinent to all e-commerce statistics are the shopping habits of the consumer. According to a Business Insider report, gender shopping habits are neck-in-neck on smartphone devices, with men shopping from their handset about 18% of time and women about 22%. As far as conversions are concerned – something all retailers want more of – tablets top the cake, explains Adobe, revealing that consumers make 30% more in purchases from a tablet than a smartphone. Still, desktops have the majority, at least for average conversion value, with shoppers unloading 50% more on purchases than when shopping from any other device. Age demographics vary, but retailers shouldn't overlook the baby boomer, either, explains Business Insider. This is because 25% of online shoppers are age 54 or older. 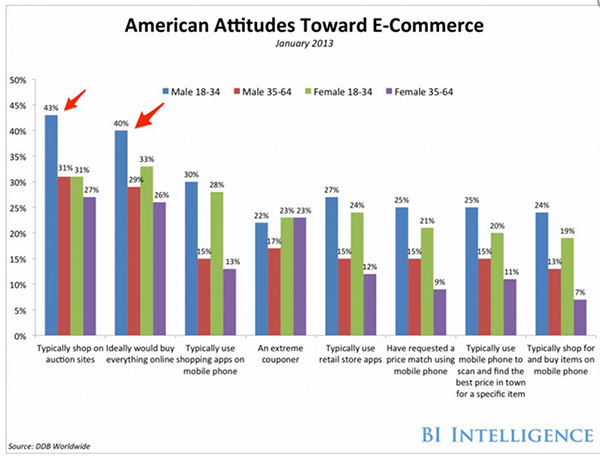 Men who are ages 18-34 shop online the most, followed by men ages 35-65, females ages 18-34 and females ages 35-64. Expect the status quo to remain steady this year, with strong increases in online spending because consumers will feel less of a pinch in their wallet, and will have easier access to e-commerce stores and marketplaces with faster checkout options. It's no mystery that shopping from your smartphone back in the day kind of sucked. Data speeds were lacking, smartphones weren't really there yet, as far as the technology was concerned, and most people had slim data plans that they didn't want to waste comparing items online (when they could just do it from their desktop or tablet from a home internet connection instead). But with recent improvements in mobile operating systems and devices, it's a whole different story. It seems that 2015 was the year that changed everything. An Internet Retailer publication reveals that 30% of all e-commerce sales for that year originated from a mobile device, most often a smartphone. The report offers a healthy entrée of mobile e-commerce statistics that should make all e-tailers salivate. Mobile 500 retailers made big gains, according to the report, notching a 68.5% increase in visits for that year, topping more than 3 billion logged shopping sessions. Naturally, unique monthly visitors skyrocketed, too, growing by an astounding 44% to 964 million. Alongside of this, mobile app downloads soared, increasing by 44%, helping haul in around $40.58 billion for online retailers. 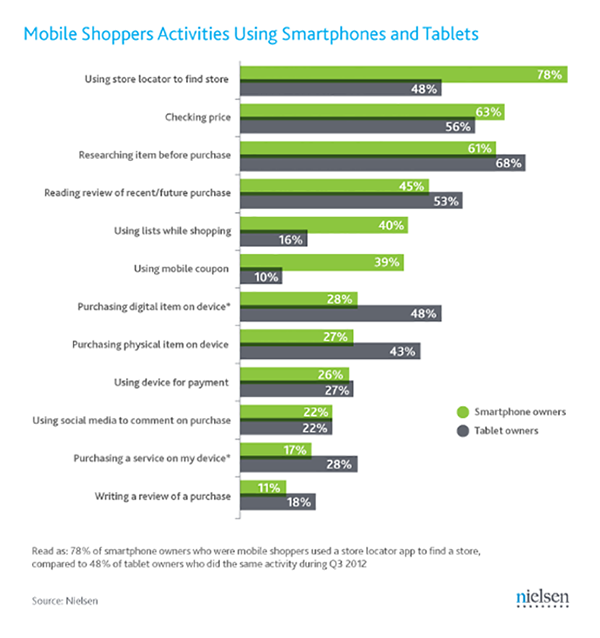 With this many people shopping, mobile usage, unsurprisingly, overtook desktop. A ReadyCloud report finds that 44% of retail internet minutes were spent using a smartphone device, while 11% were spent using a tablet, as compared to just 45% spent using a desktop. So it won't come as a shocker if 2017 sets new records for mobile shopping. Already, national retailers are integrating one-click checkouts and fully optimized mobile sites to appeal to this growing swath of consumers. Expect this trend to take center stage this year. As of 2015, 5% of e-commerce conversions were fed by social media, explains Invesp. Leading the pack (no surprise here) is Facebook, accounting for a whopping 38% of all e-commerce referrals. Pinterest comes in second at 29%, with Twitter in third place at 22%. Take a look at this infographic I've created below. It will provide you with an even better picture of how social media has become intertwined with the e-commerce referral and conversion funnel. A revealing Ad Week report shows us just how big a player social commerce is becoming. Social commerce not only feeds 5% of all e-commerce referrals – as mentioned above – but it also accounts for 5% of all online retail spending, too. Between 2011 and 2016, social commerce hauled in more than $78 billion, leaving us to only wonder what sort of a conversion treasure chest it will become by Q4 of 2017. Better technology has made it a lot easier for shoppers to find the lowest price before adding an item to the shopping cart. According to Nielson, 50% of mobile coupons that are redeemed are captured from a retailer's site by the consumer. About 30% of mobile coupons are obtained from specialty sites like Groupon and Living Social. The remainder come from email marketing campaign and discount code websites. Smartphone users are agile with their coupon searching habits, though, with about 39% of them redeeming at least one digital coupon over the past year. As of 2014, think tanks estimated that about 500 million mobile coupons were being redeemed per year. But according to a study that was conducted by Juniper Research, more than 1 billion mobile coupons will be redeemed annually by 2019. Experts say that multi-channel marketing is making coupon redemption a mainstay for this year and beyond, ranging from SMS coupons to iBeam, NFC Host Card Emulation technologies and others. What's more, a wide range of shopping apps are being downloaded by the millions, according to Internet Retailer, that do the digital coupon cutting for consumers to bring them curated deals on a daily basis. Expect this technology to become even more commonplace this year and into the future. Brick and mortar retailers are already playing around with instant coupons and price comparison apps for their shoppers, in efforts to prevent losing sales to showrooming or online price comparison searches. For a complete look at mobile coupon statistics, take a look at this infographic I've created below. What might e-commerce have in store for us this year? Here are a few candid predictions to consider so you can fine-tune your approach. U.S. e-commerce sales will exceed $370 billion (Forrester Research). U.S. mobile commerce will surpass $2 billion in purchases, with a majority of these purchases coming from smartphones (Invesp). Cross-channel sales will become the new omni-channel king, with a predicted $1.8 trillion haul (Forrester Research). 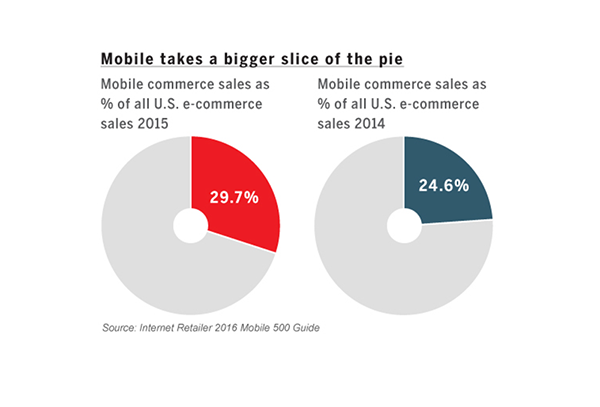 Mobile commerce sales will top 30% for the first time, and will steadily increase (Internet Retailer). 55% of e-commerce traffic will originate from a mobile device (Marketing Land). 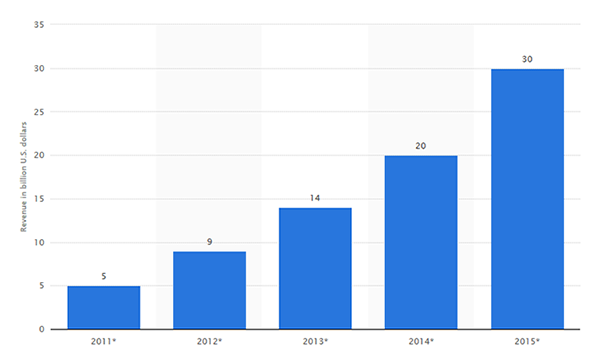 Social commerce growth will exceed 25% (ReadyCloud). E-commerce will generate at least 8.6% of all retail sales (eMarketer). 88% of online shoppers will use webrooming to find the best price (Retail Perceptions). At least 15% of retailers will offer a price match guarantee (Biz Journals). E-wallets and one-click checkouts will become the new norm (HuffPo).